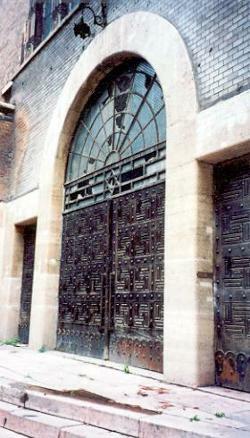 ...We go past the Orthodox synagogue on Kazinczy utca 27. It was built in 1913 and is still used regularly by the small Orthodox community in Budapest. 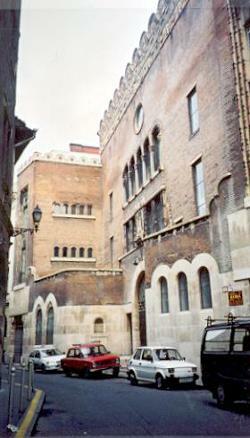 It is of darker, reddish bricks than the Dohany utca synagogue a couple streets away, and is in art nouveau style, but with similar oriental influences. It is currently in poor repair and is awaiting funds for restoration. It looks generally run down and a few windows are broken. 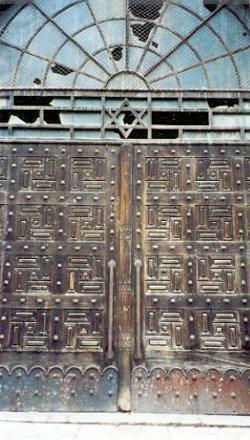 The exterior decoration includes asiatic swastikas in some of the windows and on the heavy wood and metal doors. 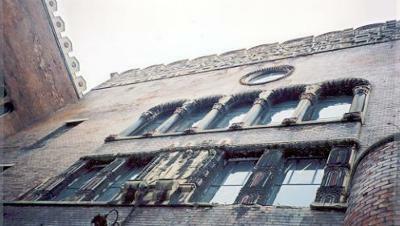 Also a castellated roofline, and interestingly shaped and decorated window frames. Well, that was in 1998. Now, two years later, the façade is still in a poor state, but some of the windows have been newly replaced, still with the tape on the glass, and I think some of the white brickwork at the base has been cleaned. The interior is said to be elegant and richly decorated, the eastern wall particularly beautiful. There are two smaller schuls, community offices, a cultural centre, kindergarten and a kosher restaurant in the complex of buildings.